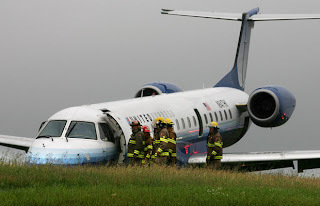 16 June 2010; United Express; Embraer E145; flight 8050; Ottawa, Canada: United Express 8050, a nonstop flight from Washington's Dulles airport to Ottawa's Macdonald-Cartier airport, landed on runway 7, was unable to stop on the runway, coming to rest about 150 meters off the end of the runway. It was raining at the time of the accident. One witness claimed that the aircraft was hydroplaning on the runway, and a second witness who was monitoring air traffic control communications reported that the pilot told the control tower he had no traction on the wet runway. The nose landing gear appears to have collapsed, although the rest of the aircraft appears intact. There was no post crash fire. Both pilots and one passenger were injured. The other 32 passengers and the flight attendant were not injured. The Transportation Safety Board of Canada is conducting an accident investigation, with the assistance of the NTSB. The Embraer ERJ-145, along with the similarly designed ERJ-135 and ERJ-170, were involved in three previous crashes during passenger flights, and none have resulted in any fatalities. In 2006, an ERJ-135 operating as an executive aircraft was involved in a midair collision with a Gol Linhas Aereas 737-800 over the Amazon in Brazil. 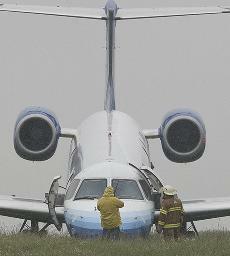 The ERJ-135 was able to land and none of the occupants were injured. However, the 737 crashed and all six crew members and 148 passengers were killed. There have been three crashes involving United Express aircraft that have killed passengers, with the most recent being in 1996. None of them involved an aircraft operated by Trans States. The NTSB database also lists about 35 previous incidents and accidents involving United Express. Trans States airlines, which has been operating under its current certificate since 1988, currently has a fleet of about 28 Embraer 145 aircraft. Prior to this accident, the NTSB lists four previous serious incidents involving Trans States. In the past, it has operated as a regional affiliate of a number of larger airlines including Delta (Delta Connection>, Northwest Airlines (Northwest Ailink), TWA (Trans World Express), United (United Express), and US Airways (US Airways Express).